GMEP activities have included; a national rolling field survey of 300 1km squares with an equal split of land in and out of scheme; new analyses of long term data from other monitoring programmes; development of new indicators; modelling to explore potential future outcomes; surveys to assess wider socio-economic benefits; and exploitation and development of novel technologies. These indicators are included in the Headline Results below to give a broad summary of the significant findings of GMEP as either 'positive outcomes' or 'areas of concern or a need for further action'. GMEP was tasked with providing a baseline for assessing the future impacts of Glastir. Future field surveys will provide the main evidence for actual change in the six original intended Outcomes. To provide an early insight into likely future impacts on the six original Outcomes intended for Glastir, we exploited a set of models and accounting tools to project the likely impacts of management interventions for soil, water, biodiversity, climate change and woodlands. None specified for now. Base line data are available for future assessments of Glastir impacts. 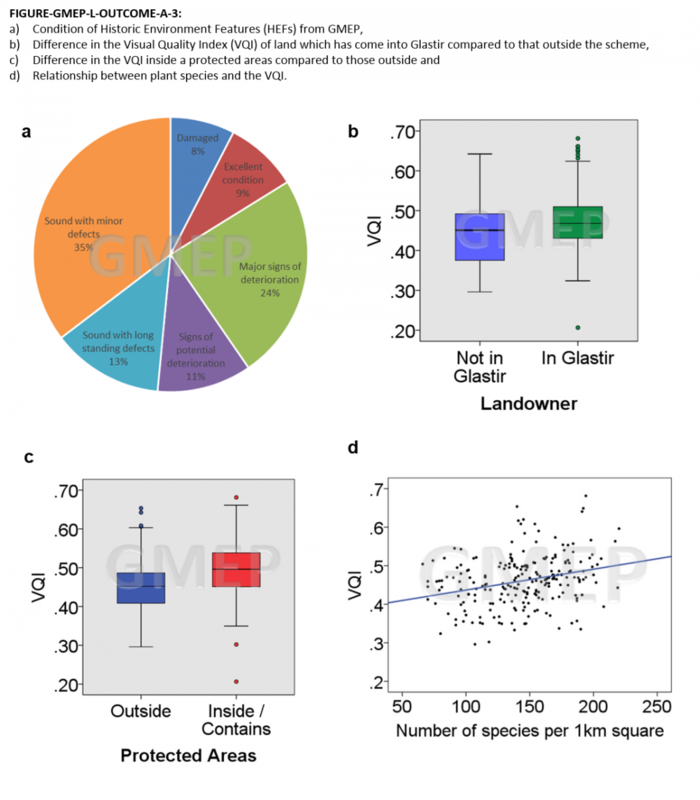 For more detail on data and findings related to Glastir impacts, visit the Resources page and download the GMEP Final Report or the GMEP Final Report Executive Summary. The GMEP 'Wider Wales' structured rolling field survey provides the control population for assessing future changes resulting from Glastir. One benefit of the structured sampling of the countryside used in this Wider Wales survey is that this control population also provides an unbiased national assessment of stock and condition of common habitats and species including woodland, soils, small streams and ponds. GMEP results can be linked to past trends to put the current observations into context. There has been an increase in the number of public rights of way that are easy to access. 66% of public rights of ways are now easy to use. This appears to have increased steadily over the last 10 years from a baseline of around 40% potentially due to projects and grants since The Countryside and Rights of Way Act 2000 act, although this link would need to be tested. 57% of Historic Environment Features are in 'Sound' or 'Excellent' condition. This is lower than assessments made by CADW for listed buildings and scheduled ancient monuments which may reflect their greater number and thus greater challenge to protect. The greatest threats identified on site were vegetation encroachment (50%); stock damage (25%) such as poaching, burrowing, path wear; and agricultural operations (13%), such as rutting, ploughing, drainage, stone clearance, pasture improvement etc. Further information on National Trends in high level GMEP indicators is available in the figures and tables below. For more detail on data and findings related to National Trends, visit the Resources page and download the GMEP Final Report or the GMEP Final Report Executive Summary. If you have a question or want to be kept up to date with developments within GMEP you can contact us through the GMEP Project Office.